Markelle Fultz heard 20,000 fans chanting "Fultz! Fultz! Fultz!" and for a fleeting moment he thought they were serenading Philly's most popular athlete. "I thought they were saying Nick Foles," Fultz said of the Super Bowl MVP for the champion Philadelphia Eagles. "Then I realized it, and it was pretty dope. These fans are great, and I love them." The Sixers and their fans wanted the No. 1 pick to play and -- after five often-confusing months -- they got him. "Just woke up and it was that day," he said. "He looked confident," coach Brett Brown said. "I thought it was a real, sort of bold, gutsy effort that he made given where he was now where he is." 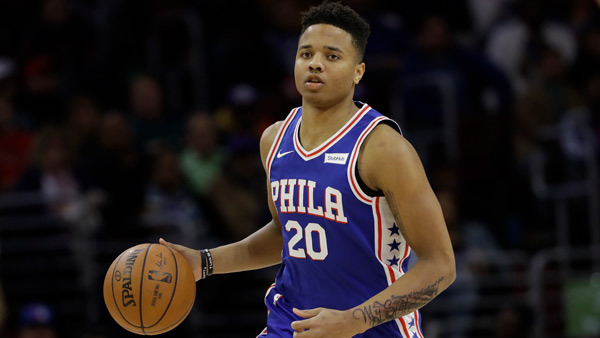 The 19-year-old Fultz played the 76ers' first four games of the season before he was ruled out indefinitely in October with soreness and a scapular muscle imbalance in the shoulder. The Sixers aren't sure what they'll get out of Fultz as they push toward 50 wins. "That is a great unknown," team president Bryan Colangelo said. "I'm not sure I have the answer. We will have to ... certainly not judge tonight as the sole case of what to expect going forward." Fultz checked in to a standing ovation with 2:54 left in the first quarter and drove down the baseline for a quick basket. But Fultz -- whose awkward shooting form made him a punchline in the NBA -- fired an airball later in the quarter. "It was a little bit of excitement and little bit of just like, I gotta help the team," Fultz said. "Once I stepped on the floor, it felt great just to be back out there with my brothers." "That's what the media's job is, to try to do what they have to do to get paid," Fultz said. "I love these guys. They're my guys," Fultz said. "I'm just trying to be the best teammate I can possibly be." Nuggets: Denver scored only 15 points in the third and blew an eight-point halftime lead. ... Jamal Murray had 17 points and Millsap 16. "They got their defense into the game in the third quarter and we didn't handle it well," Nuggets coach Michael Malone said. "We started becoming tentative. We started playing against the shot clock." Sixers: Waived G James Young. Young averaged 2.8 points in six games. ... Simmons topped Allen Iverson to set the team rookie record for assists.